This is the wonderful result of last night's canning session: 4 pints of pickles, 5 half pints of jalapeños, 4 pints of dilly beans and 4 pints of "dilly beans of death." You're probably wondering how you go about making "dilly beans of death." Its very simple actually, you have too many cooks in the kitchen and then through miscommunication you end up with 1 tsp of Cayenne pepper per jar instead of 1/4 tsp per jar!!!! *Note to self: do not give "dilly beans of death" as housewarming or "welcome to the neighborhood" gifts. 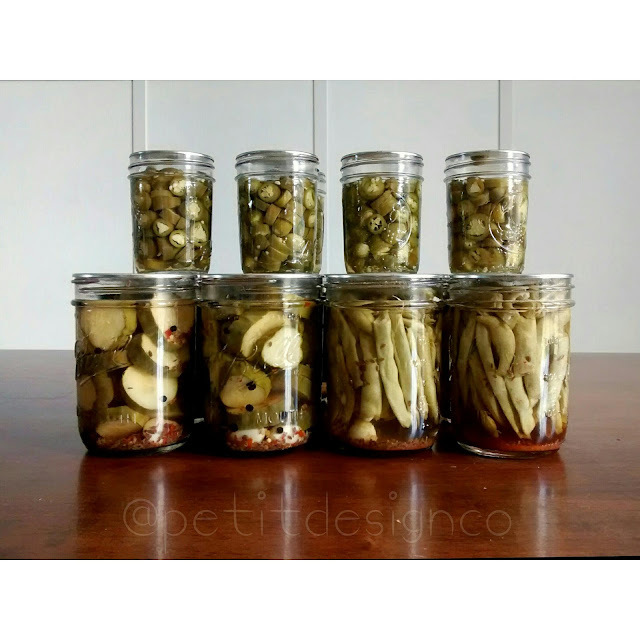 Mmm I love pickled jalapenos - and I would probably like the dilly beans of death too. Ha ha.